A few weeks ago we had made a post about how excited we were about being featured in VenturesBeat. If you’d like to see this article feel free to click here. However, today we are thrilled to announce something a bit larger, last week thethings.io appeared in Forbes! 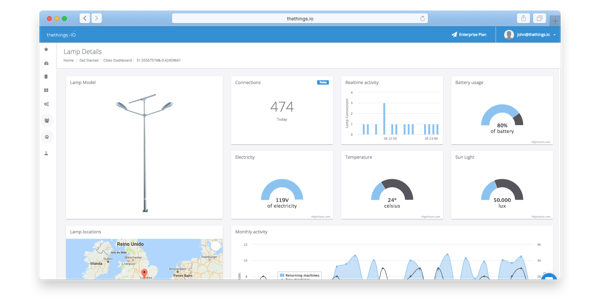 Barcelona-based thethings.iO is the latest entrant into the IoT cloud market. It proclaims to be the “Amazon Web Services (AWS) for IoT companies”. Though it seems to be yet another backend with ingestion API and real-time analytics support, the key differentiating factor is in its interoperability. thethings.iO is one the few platforms to expose both REST and CoAP APIs.Constrained Application Protocol (CoAP) is a protocol designed to be used in low-powered devices to allow them to communicate over the Internet. It is targeted at sensors, switches, valves, and actuators that are controlled remotely via standard Internet networks. Both REST and CoAP follow the same pattern of using HTTP verbs. thethings.iO uses CoAP to perform operations like activation, reading, writing and subscribing to sensors and channels. After completing the sign-up process, developers can grab an activation code to start pushing the sensor data to the platform. The node.js SDK is available on github. Thethings.iO appeared next to some other awesome IoT startups from around the world, such as Konekt, TempoIQ, SensorCloud, Xively, Temboo and PubNub. But what makes us different from other IoT startups? The main factor is our interoperability. thethings.io is capable to expose REST, MQTT and CoAP APIs, which allows different kinds of devices to use cases to communicate over the Internet. Forbes’ article sums up all of this in their article, so make sure to check the whole piece out. Stay tuned for more exciting posts from thethings.iO about The Internet of Things and don’t forget to follow us on Twitter and be sure to check out our #IoTFriday blog! VentureBeat features thethings.iO as the Amazon Web Services for the IoT!